Matthew Schmitt secured a spot in Platte County High School wrestling history by becoming a three-time champion. Now, Schmitt has added another accolade two years after leaving Platte City — becoming the school’s first-ever Division I national qualifier. Schmitt took third place this past weekend for West Virginia in the Big 12 Championships held in Tulsa, Okla.
A redshirt freshman, Schmitt took fourth place in the 133-pound class and secured one of five spots granted to the Big 12 for the upcoming NCAA Championships held March 15-17 in Cleveland. All weight classes at nationals will feature 33 wrestlers competing for the title at Quicken Loan Arena. Schmitt, seeded fifth, went 3-2 in the two-day event at the BOK Center. He ended with a 2-1 loss to Wyoming’s Montorie Bridges in the third-place match on Sunday, March 4. Earlier in the day, he bested North Dakota State’s Cam Sykora, 6-2, in the consolation semifinal. The two met on Jan. 7, with Schmitt winning 3-1 in a sudden victory. Schmitt opened with a technical fall over Fresno State’s Trevor Williams and then picked up a 9-2 win against Northern Colorado’s Rico Montoya. That win avenged an earlier setback for Schmitt. He lost in the semifinals against top-seeded Seth Gross of South Dakota State, falling 8-2. The Mountaineers finished ninth in the team standings. Schmitt will be joined in Cleveland by a trio of former Park Hill standouts. Ke-Shawn Hayes of Ohio State and Missouri’s John Erneste automatically qualified for the national finals, while Missouri’s Canten Marriott earned an at-large bid that was given out on Tuesday, March 6. Hayes took third place in the 149-pound class at the Big Ten Championships held in East Lansing, Mich. The three-time state champion at Park Hill, Hayes went 4-1 for the Buckeyes, who repeated as conference champions. Hayes posted a 12-1 major decision against Eric Barone of Illinois in the opener and then beat No. 9-ranked ­— to Intermat rankings — Colton McCrystal of Nebraska, 7-6, in the quarterfinals. In the semifinals, Hayes lost to No. 1-ranked Zain Retherford of Penn State by a 1-0 decision. Hayes came back with two wins against ranked wrestlers, first beating Maryland’s Alfred Bannister — No. 18 — by a 9-1 major decision. In the third-place match, Hayes beat McCrystal for the second time, this time a 7-5 decision. Hayes improved to 10-5 this season against nationally-ranked foes — the most matches of any Ohio State wrestler this season. Erneste, a redshirt junior, repeated as a conference champion and Mizzou won their seventh straight Mid-American Conference Championship on Sunday, March 4, in Mt. Pleasant, Mich.
Erneste (133) repeated as a conference champions in the same weight class this year and will go to nationals for the second straight year —where he advanced to the round of 12 last year. He beat Buffalo’s Bryan Lantry, 4-2, in the championship match on Sunday. He beat Northern Illinois’ Alijah Jeffery, 6-0, and Kent State’s Anthony Tutolo by a pin to reach the finals. A four-time state medalist at Park Hill, Erneste is 22-2 entering the NCAA meet and was No. 7 in the latest NCAA rankings. Marriott (184) finished third, winning his final two matches for Missouri. He beat Eastern Michigan’s Hunter Yeargen, 5-2, then topped Central Michigan’s Jordan Ellingwood in the third-place match. Marriott beat the No. 14 nationally ranked Ellingwood 9-1 earlier this season. Marriott, a redshirt freshman who won a state title for Park Hill as a junior, opened with a win against Kent State’s Colin McCracken, 3-2. The No. 1 seed in the MAC tourney, Marriott was upset by fourth-seeded Bryce Gorman of Northern Illinois, 6-5, in the semifinals. Marriott (25-5) was ranked No. 15 in the NCAA rankings and No. 13 in the RPI heading into the MAC Championships, but had to wait until the NCAA Division I selection show to learn that his season would continue. In another tie to Park Hill, Daniel Lewis (174) won his third conference title for Missouri. 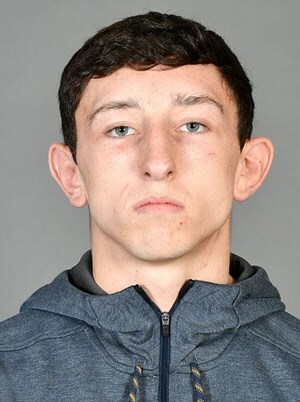 The Blue Springs native becomes the sixth Tiger to win three conference championship, joining a group that includes former Trojan wrestler Alan Waters, who won league titles in 2012-13 and 2015.